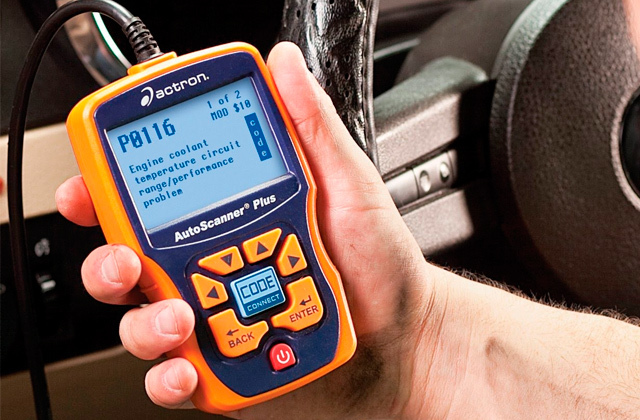 The built-in temperature compensation feature adjusts the voltage level according to the environment the car is in. The status indicator tends to have a non-insignificant margin of error. 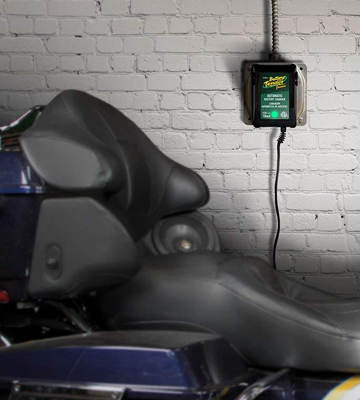 An intelligent automatic trickle charger from Battery Tender that utilizes a 4-phase charging cycle to keep your battery in a top-notch condition by providing an always stable power output. If you want your car to stay with you for a while, this is the model you should opt for. The patented CPU detects the voltage of the battery, while the desulphation mode offers an additional level of protection. Gets hot during prolonged use. This model from Schumacher is capable of maintaining even the most capacious batteries out there, thanks to its 1.5A current output. What's more, the lightning-fast charge process makes short work of any depleted battery and makes the wait far more bearable. A great find for those who love efficiency. The compact dimensions allow you to carry and transport it comfortably in any vehicle or backpack. The model comes with relatively short cables. 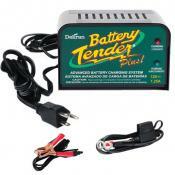 This is a decent battery charger, which offers a good quality and an excellent value for money. The device ensures an impressively fast charging. The body of the charger has special mounting holes, so securing the device in the needed position is a piece of cake. The clips do not always provide a tight grip on battery posts. This smart and portable charger is capable of switching between charging mode and float mode automatically. 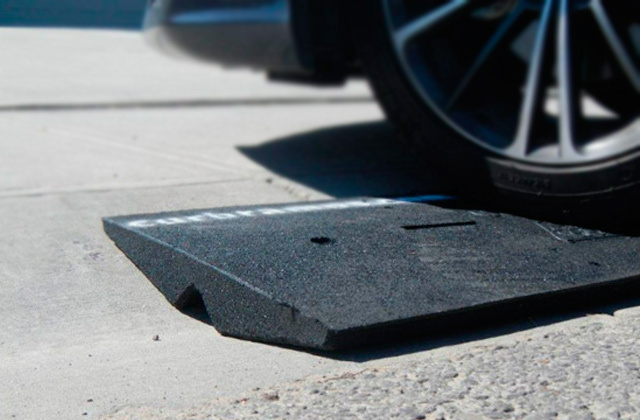 It is a great solution for every car owner! Thanks to the suction cups you can attach the device on almost every window. On top of that, the housing has an IP44 protection rating so you can even install the appliance on the outer parts of your vehicle. The output current power may not be suitable for big vehicles. 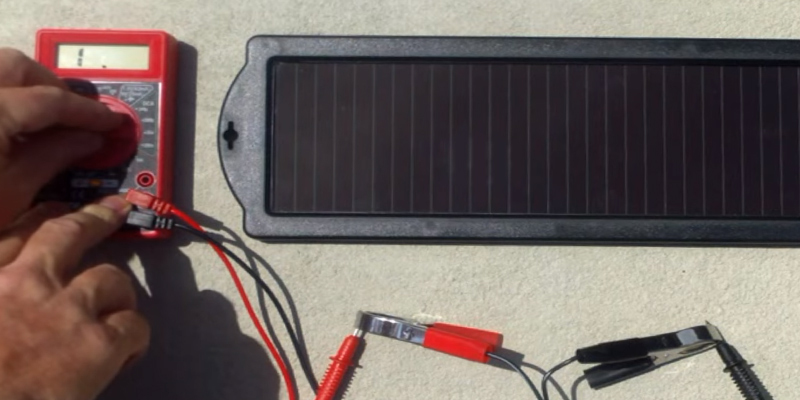 With this little charger, you won't need any AC outlets to power up your car battery any longer: this device converts the energy of the sunlight into 1.5W / 0.125A of electric power. That will be enough to start even a medium-sized car or a big motorcycle, so if you like eco-friendly power - this is a no-brainer choice. 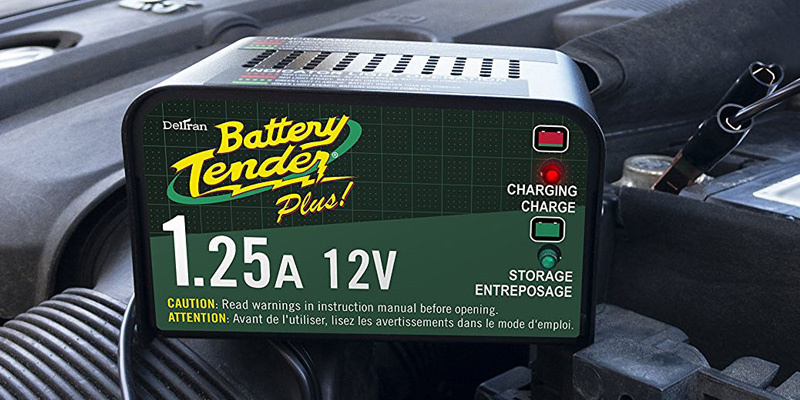 The Battery Tender Plus 021-0128 is one of the best trickle chargers on the market today, thanks to its reliability and power output, hence, it will be suitable for motorists of all sorts, so let’s break down why it is so good. 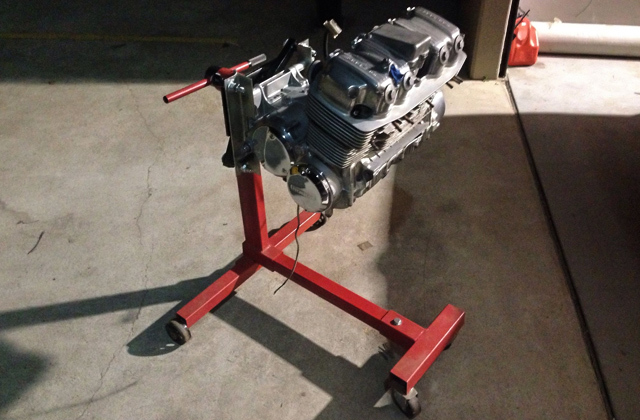 First of all, this 1.25A trickle charger is capable of powering up motorcycle, car, and even truck batteries twice as fast as the competing models with lower amperage. The simple yet convenient interface of the appliance features two indicators that will show the charging status of your battery, while the fault indicator will signal any problems in the electrical circuit. 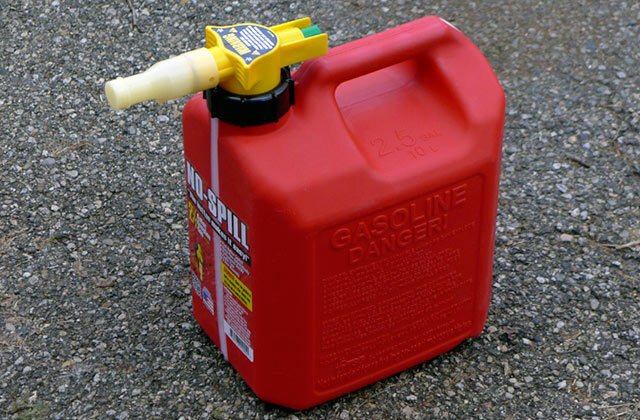 Although this model can be used for almost any vehicle that features a lead acid battery, the jumper cables might be a bit small for car batteries. In case you want to use the charger on your car, we recommend double-checking the alligator clips when you connect them to the pins of your vehicle’s battery to exclude the risk of electric discharge. 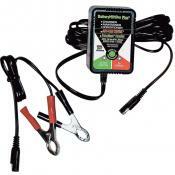 Alternatively, you can purchase any 12V jumper cable set for using it on your car specifically. 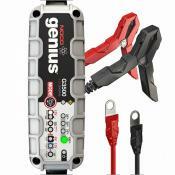 Nevertheless, the float charging process doesn’t need the clips to firmly grip the connectors, unlike regular jump starters. That said, it is important to not touch the metal parts of clips during the charging process since there is a risk of an electric shock. 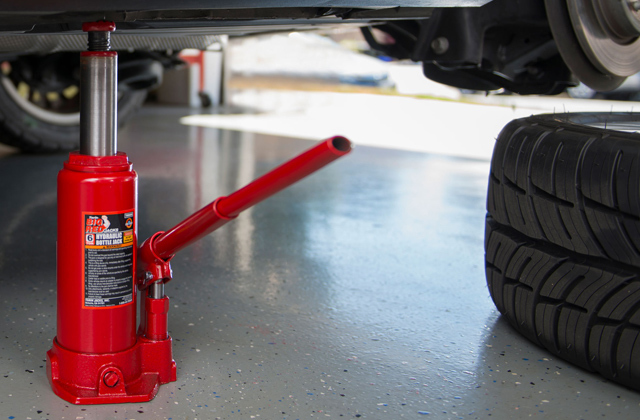 To wrap things up, the Battery Tender Plus can become your vehicle’s best friend that will protect its battery from reverse polarity discharge, sparks, and short circuits. Regardless of what type of car or bike you drive, this all-purpose charger should do the trick. Small and light weight. Easy to use. Good indicators on charging status and battery charge. It is a bit slow, but I like the built in safety features that allow me to keep my battery fully charged while my car is in storage. Excellent battery charger to keep my lead acid batteries topped off. As mentioned AGM requires a different charger that is optimized for it, whereas this charger is what you want for lead acid. I charge my motorcycle, and both cars with it. 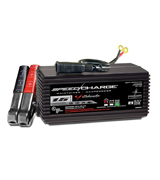 Engineered specifically for small to medium vehicles, the Schumacher SEM-1562A-CA trickle charger can still easily maintain the charge of large car batteries’ without too much of a hassle. 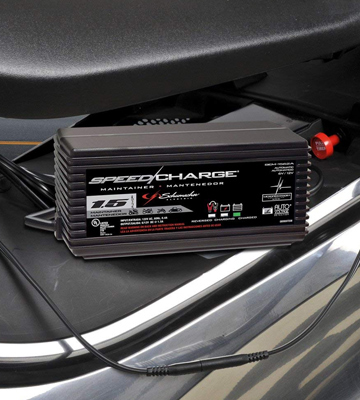 While the 6V / 12V charger maintains the discharge level at a minimum, the 1.5A float device will ensure that the battery will be charged quickly. So quickly, in fact, you won’t even notice that the charge was depleted in the first place. When the powering up process has been completed, the device will automatically go into monitor (floating) mode to conserve energy. In case the charge level starts dropping, the appliance will keep the battery topped up. 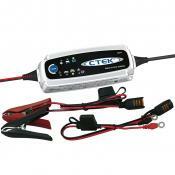 Although the tool is quite good in keeping the battery of your vehicle juiced up it will not charge a completely drained one. On the bright side, however, the charger comes equipped with two types of clamps - jumper cables and o-ring connectors, which makes it suitable for a variety of lead-acid batteries. 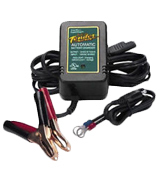 All things considered, with a weight of only 2.5 lbs this fully automatic trickle charger is a portable must buy for every motorist that cares about their vehicle. 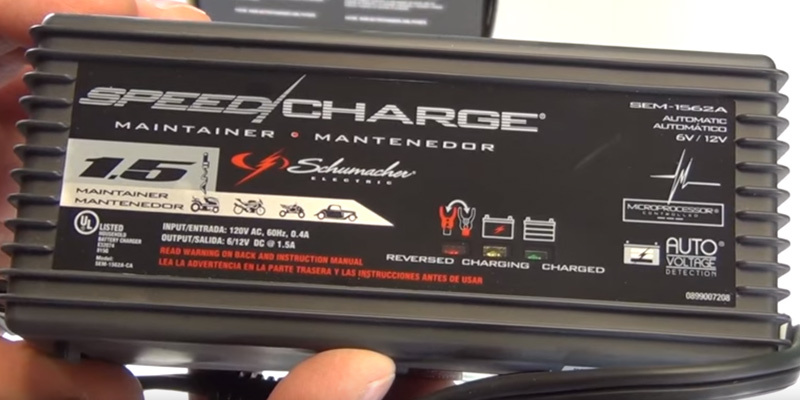 If you don’t drive enough to constantly keep watch on your battery level, the SEM model from Schumacher will do it for you, which makes it a top pick in our eyes. 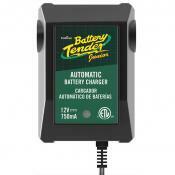 The Battery Tender Junior is one of the most compact chargers, which comes with the additional auto mode function. You will have no problems using this equipment since it doesn't require any special configuration or adjustment. 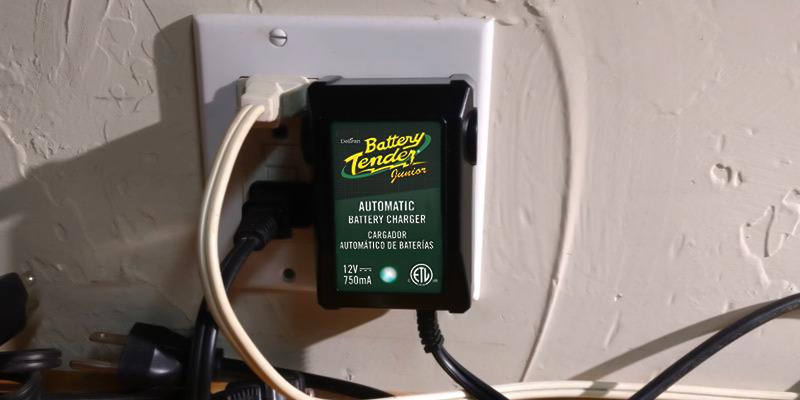 The Battery Tender Junior automatically collects all the required data from the battery and then adjusts the output current and voltage based on these data. This function enables the car battery charger to use the optimal and fastest charging mode as well as prevent the battery from overheating during the process. Such functionality is implemented in the charger owing to the built-in microcontroller, which determines the actual battery charge level and the corresponding charging voltage. 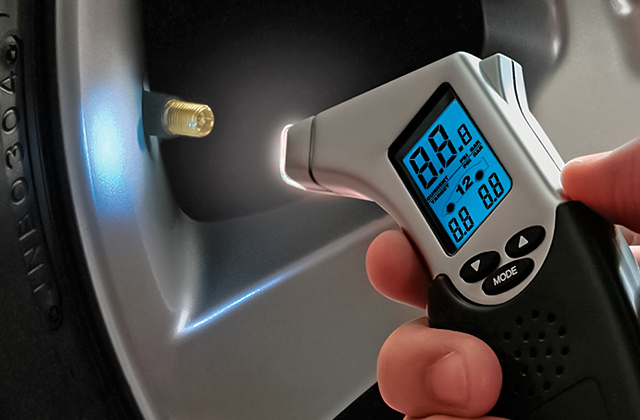 The charger has only one LED indicator, however, its two-color scheme allows displaying the complete information regarding the battery condition. 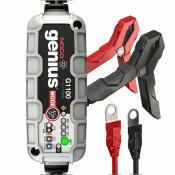 Taking into account the fully automatic operation of the device, all you need to do is connect charger clamps to the posts on your car battery with the corresponding polarity, and then plug the charger socket into your household outlet. Yes, it's that easy! 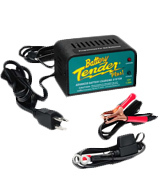 The Battery Tender Junior comes with two pairs of different connectors, which are ring terminals and battery clamps, to offer you the selection of the common options of hooking up the charger to the battery terminal posts. Speaking of the device automatic operation in more detail, before initiating the charging the Junior 021 performs additional diagnostics and checks whether the polarity is observed. Thus, even if you connected the cables incorrectly, the special LED indicator will warn you about the wrong connection. However, we recommend reading the operation manual carefully before using the unit. Another great benefit of the Junior is the manufacturer 5-year warranty for the product! Just the Ticket for my lawn tractor, put the lugs on the battery terminals and charges like a dream. When I want to use the tractor I disconnect the connector and use the cap that comes with it in the end and start the tractor up. Auto off feature sp you don't have to worry about ruining your battery. The new unit is so light weight it almost seems hollow inside. 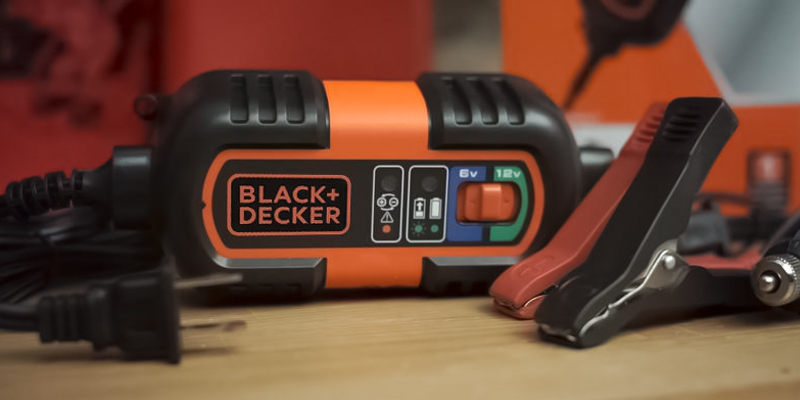 With the advantageous design and automatic charging mode, the BM3B Battery Charger by Black&Decker really deserves a special attention. Actually, it is one of the easiest-to-use models, all you need to do is just set the sliding switch to the right position (6 or 12-volt depending on your battery), attach the clamps to the corresponding posts of the battery and plug it in. The BM3B charger will do the rest! 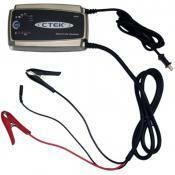 The BM3B charging equipment shuts off automatically when your car battery is charged completely. In addition, special indicators show the battery charging status. 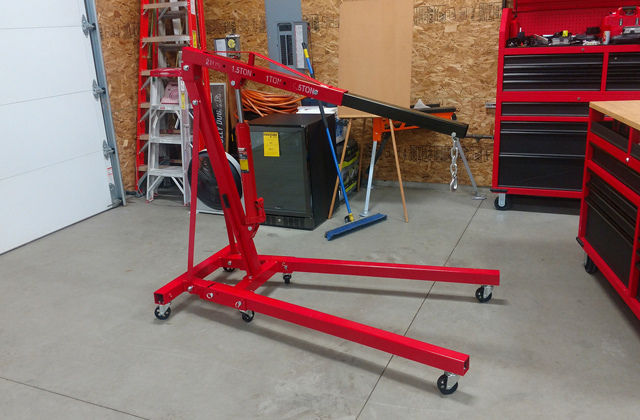 This Charger/Maintainer comes with mounting holes that can be used for a reliable mounting of the unit in a vertical or horizontal position on any workspace. 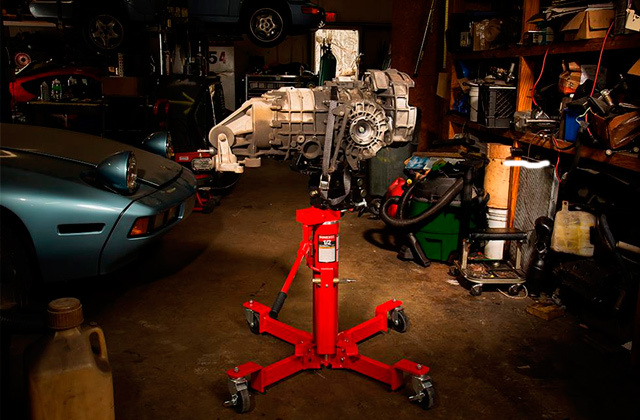 For example, you can secure it right on a wall in your garage or in any other convenient place. 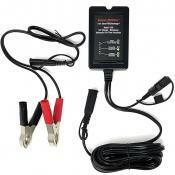 With its compact and practical design, the BM3B Battery Charger/Maintainer offers other important advantages. 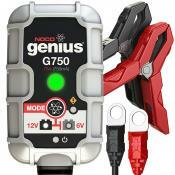 Apart from battery clamps and ring terminals, the model comes with a DC plug for charging the battery of your vehicle via a cigarette lighter receptacle. In some cases, the use of this connection brings benefits, as there is no need to open the hood to access the battery. However, it's important to make sure your car allows this way of charging. To connect the charger to a battery, simply attach the positive (red) clamp to the positive (+) post on the battery and the negative (black) clamp to the negative (-) post. 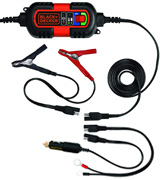 The BM3B Battery Charger/Maintainer features a protection against reverse polarity, thus in case of incorrect connection, the indicator will inform you about the misconnection. 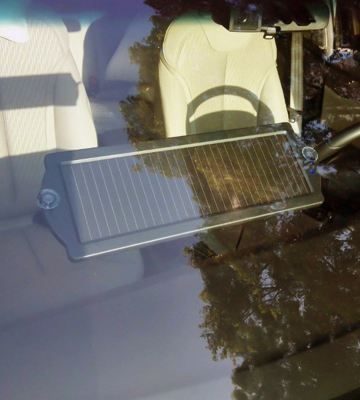 The Sunway Solar is a rather unusual car battery charger that is surprisingly convenient to use on small vehicles, such as motorcycles, scooters, boats, and hybrid cars. All you have to do to keep your battery charged is install the device on one of the transparent parts of your car such as the rear window or windshield. 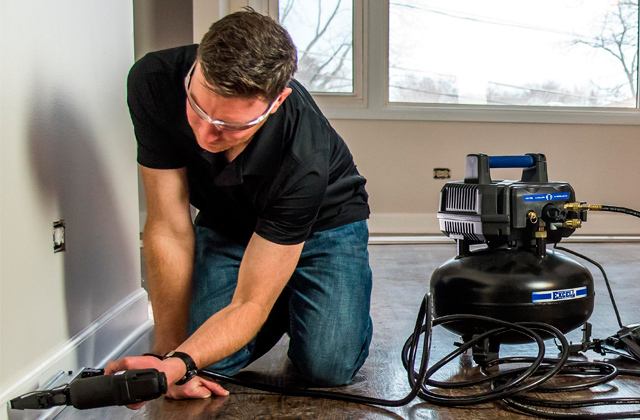 The charger comes with suction cups that allow for installing the device on virtually any type of flat surface including glass and metal. 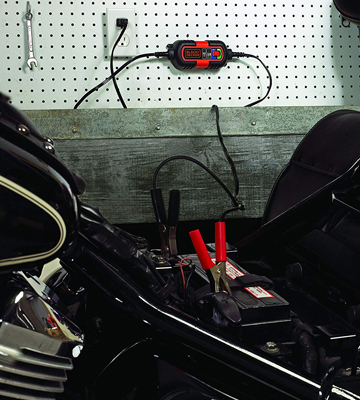 In addition to mounting accessories, the charger is supplied with standard ring clamps and a 16-foot extension cord that makes this model so convenient to use. 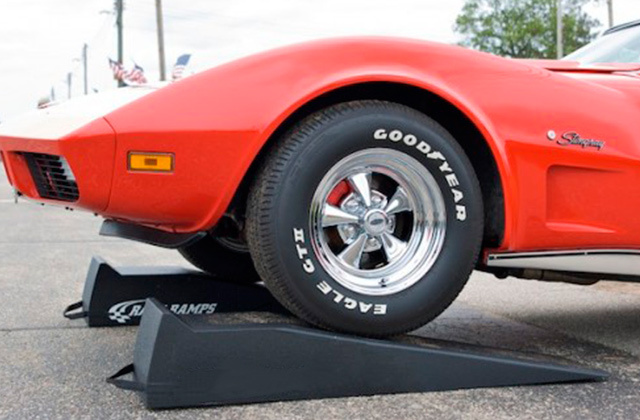 The solar technology used in this charger ensures that you won’t need any additional cables or outlets in order for the device to run and effectively maintain the vehicle’s battery charge. 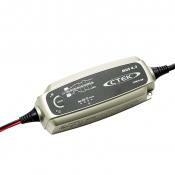 The 1.5 W output of the appliance is more than enough to charge small 12V batteries. As for the much bigger models, the charger may have a hard time maintaining those with it’s 0.125A current output. 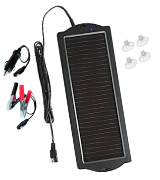 In case you want an eco-friendly solar-powered charger for your SUV or a truck, there is a 3W / 0.250A model that will keep their batteries alive. Despite the fact that the device has low power output, the high-quality solar elements maintain a stable current and wattage even on a cloudy day. Small, handy, and highly convenient - you just can’t go wrong with this model from Sunway Solar, especially if you want an eco-friendly option. 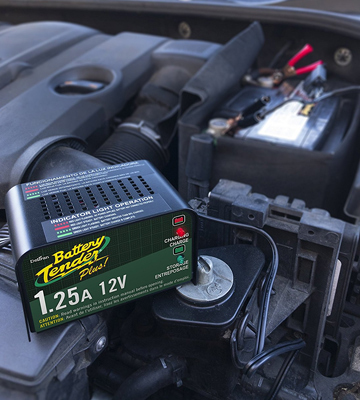 A regular car battery operates in the temperature range of 30°F and 90°F, thus, even the slightest hike or drop in temperature can cause capacity damage and shorten its service life significantly. On top of that, with a self-discharge rate of lead-acid batteries varying between 8-20% of the total capacity, you will definitely need a tool that will keep them charged, especially if you don’t use the vehicle too often. It can be a real challenge to keep the batteries of your steel horse charged, especially in the colder time of the year. 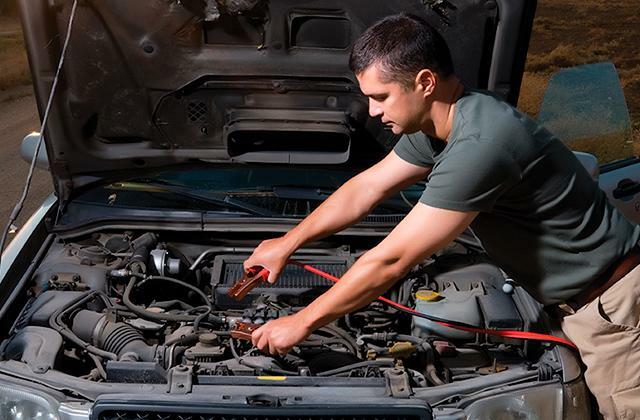 In case you are living in an area where winters are severe you probably know how bad it can be when your car or truck just won’t start on the first try. 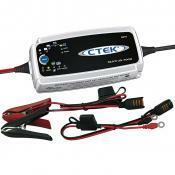 A trickle charger will help you keep your vehicle’s battery charged and ready to go at any time. Trickle charging can be crucial in case you rely on your car to get to work on a daily basis or in case you use your vehicle as a seasonal transport (motorcycles, ATVs, or convertible cars). 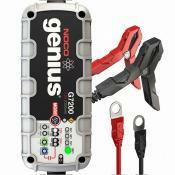 If you are looking for more sophisticated car gear you may be interested in jump starters and pressure gauges to keep yourself safe on the roads.